My cheese workshops are rapidly becoming the most popular out of all the classes, last weekend we made Halloumi and Ricotta cheese. I think everyone is so amazed how easy it is to actually make soft cheeses and fascinated by the process of turning milk into curds and whey. We always have a lot of whey left after these events, as you can imagine from a class of 6 making their own produce. Luckily living rurally there are a few people who take it for their chickens and the rest I dilute and put it on my herb garden, which in these dry months it has been a blessing since we are on tank water not mains. I make a salad with mine using the ingredients you can see in the photo and adding the dressing from the previous post on cauliflower salad. In a large stainless steel saucepan heat the milk to 32C, using a thermometer. Allow the milk to sit, covered with a cloth in a warm place for 20 minutes or until a firm curd has formed. When the the curds are formed cut into 1 inch squares. If the pot is deep also cut across with a slotted spoon. Rest for 5 minutes, then heat the pan to 35-38C and stir gently with your hand or spoon for 20 minutes, keeping the temperature constant. The squares should look smooth and lightly elastic. Cover with more cloth and place a weight on top. Now cut the Halloumi cheese into pieces. Reheat the whey to 85-90C, then turn heat off and add the halloumi pieces to the whey. Cook for about 20 minutes, stirring from time to time. The cheese will rise to the surface. Take the cheese slices out, add a pinch of salt on each side. Make a brine with 50% leftover whey, 50% boiling water and 10% salt. The halloumi will keep up to two weeks in the brine, in the fridge. the only cheese ive made at home is indian paneer (using milk and vinegar). i LOVE halloumi and im so happy to see this post! is it possible to make this cheese without rennet? You do need a rennet to make halloumi to create the curds and whey which is different to making paneer and ricotta, the good news is you can buy vegetarian rennet. Check online to see who is selling it in your region. I read somewhere you can also use lemon juice. I am going to try this with lemon juice this afternoon. awesome post! love it! Haloumi at home! i love haloumi but also am curious if you can make it without using rennet. we love halloumi. any finely crafted cheese really. during a trip home to Wisconsin we bought rennet tablets and made our own mozzarella. it was incredible. i think we might have to try this, too. Great post. Although I have a good understanding of the cheese making process I had no idea what gave halloumi its squeaky mouth feel. I am so making this. Got a question. I have only rennet (junket) tablets. Will they work? If yes, what quantity should I use for 1/2 tsp rennet! Many thanks from another passionate soft cheese maker! What a great recipe! I love halloumi cheese – it would be so great to make. I need to stop procrastinating and order rennet online. One question: you mention vinegar in your ingredients, but it does not appear later on the cooking directions. When do we add it? Thanks so much – I really love your site. I wish I were in New Zealand to attend your cheese making class. One day :-)…. Hi, thanks for spotting that, in my rush to go on holiday I overlooked the vinegar! There is no vinegar in the making of halloumi cheese, I have amended the recipe. In the class we made ricotta & halloumi since ricotta is meant to be a byproduct of the whey after removing all the curds by adding vinegar. I can’t say I have ever been successful creating in producing much ricotta from the whey and prefer to make it from like directly which produces more. I will try and get around to posting the ricotta recipe too, it’s so easy with just milk & vinegar. Wow, this is such great information. I live in China and we can’t get fresh cheese, but I do have a little bottle of rennet I brought from home (it’s a vegetarian liquid rennet from Whole Foods). I will have to try this recipe! That looks so good! 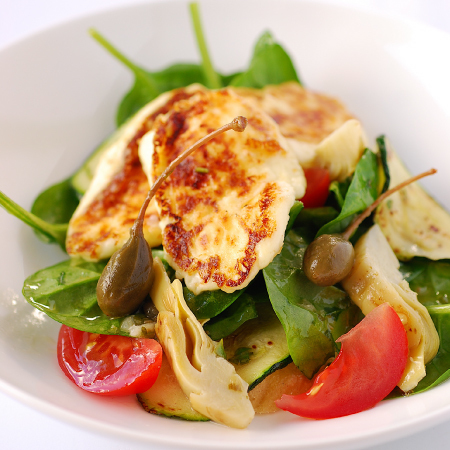 Halloumi is one of my favourite cheeses, especially on a salad or in a wrap. I’ve made my own mascarpone, but never think that other cheeses, like halloumi, would be easy enough to do myself. This is very tempting! Thanks Alli… didn’t realise you were ‘so into cheese’ , just like me! Going down the pages can see loads of cheesy recipes!! YAY! Thanks for the answer to my question. Will dig out the poor forgotten junket & check the strength. I discarded them after a mozarella disaster! Have you ever tried that one? Lovely post. Nice to have halloumi after a very long time. I have a question though that no one has yet been able to help me with and i have myself not been able to find anything on the web related to the following. I am looking for a recipe for Akkawi cheese. Can you pleeeeeease help me out here? Would really appreciate it. Thanks. halloumi is one of my favourite cheese!!! Thanks for the recipe. Your halloumi looks awesome! wow that haloumi looks fab. I love haloumi…pan fried with a squeeze of lemon and a sprinkle of chopped parsley…yum! I must try making it. I guess I have to order rennet online (as per someone else’s comment)? You can buy it in some supermarkets, it is usually near the ‘set’ pudding mixes because it is also used to make junket. I know overseas they also sell junket tablets which would work also. I’m sure you would be able to get it in the Woolworths supermarket in Aussie, they sell it at Countdown here, usually in the milk pudding/fruit pulp isle. Hi, I’ve just tried this recipe and run into a problem. I’m wondering if anyone has any suggestions. I heated my half galon of milk (aprox 1.9 L) in an enamled cast iron pot to 32c, and mixed in half a Junket tablet disolved in a small ammount of cold water. My kitchen is warm today, so the pot has stayed at a constant tempature, and yet, 3 hours later, nothing has set up. It’s still as thin as milk. I’m in the US, and using organic homogonized cows milk, Junket Rennet tablets (which have no expiration date?) and this is my first time making a rennet cheese. The box suggests a quater tablet should coagulate a galon of milk. I’m suspecting that either my milk isn’t as acidic as it should be for some reason, or the rennet is old. I’ve also seen several suggestions online that the tablets should be shelf stable for several years. Hi, I believe the problem is that you were using homogenised milk and not pasturised milk or fresh milk from the farmer. I only recommend pasturised or fresh as it is what I was taught at cheese making school. Homogenisation involves a process that reduces the size of the fat globules into miniscule portions dispersing them evenly throughout the milk so I think this makes it difficult to produce a curd. Hi again. I did try making cheese again and it was a success. I went with a mozzarella recipe, but will be trying this recipe next weekend. In the US its very hard to find non-homogonized milk, and in some states it’s actually illegal to sell raw milk. (I know, we’re crazy) I think the problem was the Junket brand rennet tablets, as they’re for making rennet custard, not explicitly cheese. Some have gotten those tablets to work, but I wouldn’t recommend them. Thanks for this post, as an inspiration for a new delicious hobby! Hi, I’m glad you tried making cheese again and I hope you have much fun and success with the mozzarella! I have never used the rennet tablets but only the rennet liquid which is also used to make junket/custard here in NZ, or used to but is not o popular anymore. We also have more homogenised milk here but we also have easier access to farm bought fresh milk. Great recipe, enjoyed reading it. Would you miind if I referenced it on my cheese blog? I still haven’t made my own cheese, but this looks really good. I would love to try it out. I was so excited to come across this recipe! I love halloumi and if I could I think I might eat nothing else, but it’s so expensive to buy. I had no idea that it was such a simple process to make and will try this recipe soon! Thanks so much for the post. Also, do you use liquid rennet or tablets? Does it make a difference? Thanks! I have only ever used liquid. The tablets will have a different strength so I suggest you go by the instructions on the tablet packet for ratio of tablet to milk. Good luck and let me know how it goes with tablets if you use them. I just used 1 junket tablet to make this out of 2 litres of milk the other day (the strength was indicated by 1 tablet to 0.5L milk). I made my haloumi in a microwave in under 1 hour. It didn’t need the extra heating, just the initial step to 32C. I have tried several making Halloumi recipes and each time, I find that thecurd forms, I cut it into 1 inch strips etc but when I heat it, it then just breaks up into thousands of little bits. It never seems to stay in the firm strips so I then have to strain it to make a big lump as it would be impossible to lift it from the pan in all those tiny bits. Do you have any idea what I’m doing wrong please! Hi Andrea, sorry to hear you aren’t having much luck with the cheese making. My first question is what milk are you using? After just being home to the UK Iast month I found it difficult to find milk that wasn’t ultra treated or homogenized. These two types of milk can produce what they call weak curds that crumble rather than stay in firm curds. Here is a great website that explains all types of milk in cheese making, some pics of weak curds too. I only ever use pasteurized and not ultra, my experience is nothing else works. Try adding a small amount of calcium chloride, available from cheese supply stores online, it is used to replace the calcium lost during the pasturisation process, especially store bought milk. Use it for any type of cheese when you use store bought pasturised/homogenised milk. What would be the difference in the halloumi cheese if I use culture starters? Has anyone tried both methods and noticed any difference in taste or softness? Hi Tom, I haven’t used a started myself but a fellow blogger has for mozzarella http://alessandrazecchini.blogspot.com.au/2012/02/making-mozzarella-and-ricotta-at-home.html perhaps see if she has some feedback.